This is it: the moment we’ve all been waiting for. Ford has just released its newest ad with “Ambassador of Service” Dwayne “The Rock” Johnson, which is the first in an all-new campaign. We have one or two issues with it. But before we break it down for you, watch the ad at least once for yourself, unspoiled by our petty nitpicking. 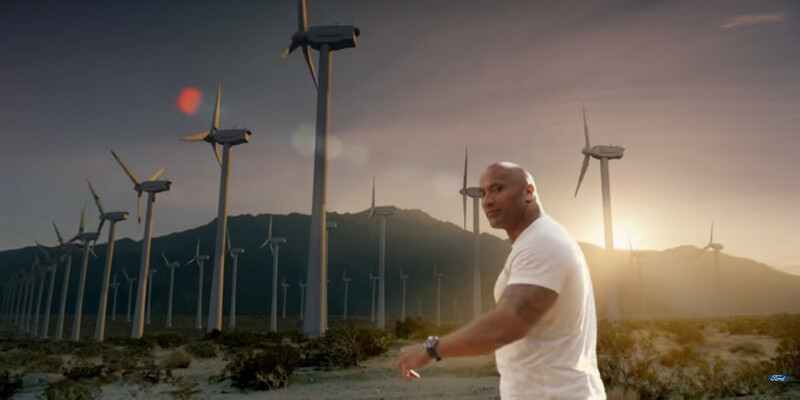 For the love of God, Dwayne, get the heck out of the road! 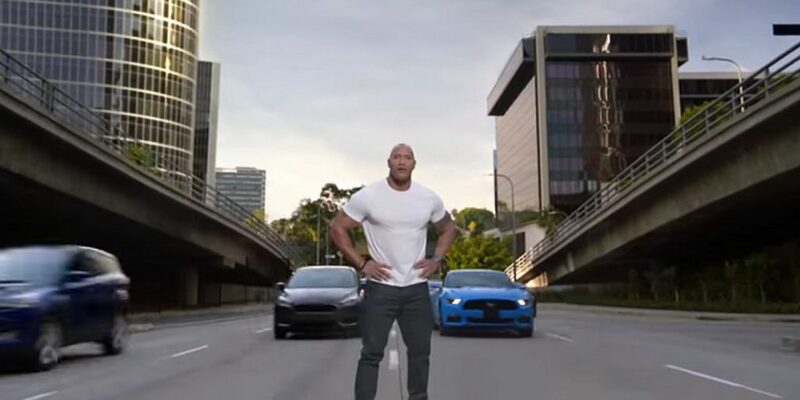 The commercial opens close on Dwayne Johnson’s face against an urban backdrop, and as the camera pulls back, we see that he’s standing in the middle of a highway, with various Ford models zooming past at, you know, highway speeds. Already, we’re off to a bad start. See, standing in the middle of a busy road is something that one generally shouldn’t do. It’s the sort of behavior that one more readily associates with people who suffer from sleepwalking, or who’ve lost time due to dissociative fugue, than with psychologically-healthy men in full possession of their faculties. Should we really be taking consumer advice from such a person? At least The Rock is safe; many of those Fords are probably equipped with Pre-Collision Assist with Pedestrian Detection. And he’s built like a tank. Like a windmill, The Rock’s diet consists mostly of unsuspecting, wild birds. Actually, first The Rock goes to Ford’s Climatic Wind Tunnel. And then to a crash-testing facility with a blaring alarm that everyone seems to be ignoring. And then he goes to a wind farm. That’s really disingenuous, if you think about it, as the US currently only gets around 5% of its electricity from wind. The biggest provider of juice in America is still sweet, sweet coal. After that, Mr. Johnson walks briskly through a Ford design studio, an assembly line, and a dealer service garage, passing from scene to scene quicker than you can blink. At no point does anyone ever think to stop him and say, “Excuse me, sir, but we’re going to need to see some credentials.” Maybe he can’t be stopped, as he clearly has the gift of teleportation. Lock your doors if you must, but it’ll make no difference; The Rock is coming. What’s he always walking for, anyway? Who wrote this commercial: Aaron Sorkin? They all share one bunk. Oh God, he has an army. Who do you think can pull more weight: The Rock, or an F-150? Dwayne Johnson may be a Ford man, but no one believes that the highest-paid actor in the world would own this plain, ordinary F-150. Plus, look at the way he intercepts the key fob from the speechless Ford service professional in this scene, concealing it slyly in his palm, saying “thank you, ma’am,” and counting on his winning charm and good looks to compel her to keep his grand theft auto on the down-low. 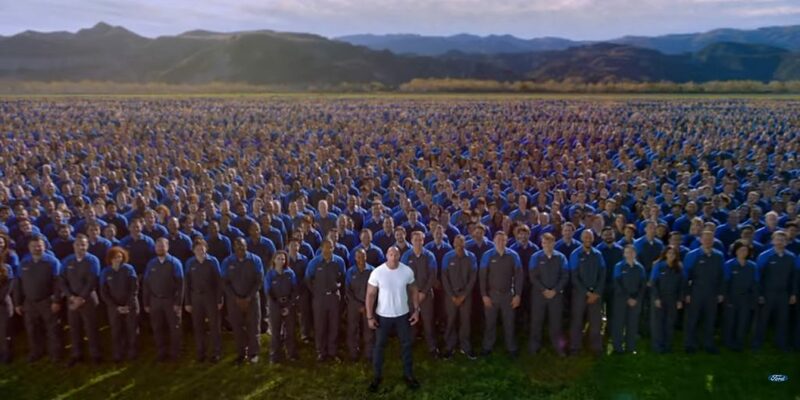 We look forward to further ads from Dwayne “The Rock” Johnson’s new Ford Service campaign – if for no other reason, so that we can overthink them and fixate on petty details.